A trip back to India is always refreshing and rejuvenating – especially if you get to make one without kids ;). It gives one time to think, eat peacefully and also to pick your family’s brains for recipes without getting interrupted. I was able to make one such trip recently and came back with loads of recipes! The first one I posted during my visit was for these amazingly soft Kappa Ruttis which mom shared with me. The other dish that I enjoyed having and making the most was for Buttermilk dosa and it comes from one of my favorite aunts! Thanks, Prema Aunty for the recipe, for making these soft dosas for me and also, for guiding me through this process and providing feedback till I got it right. 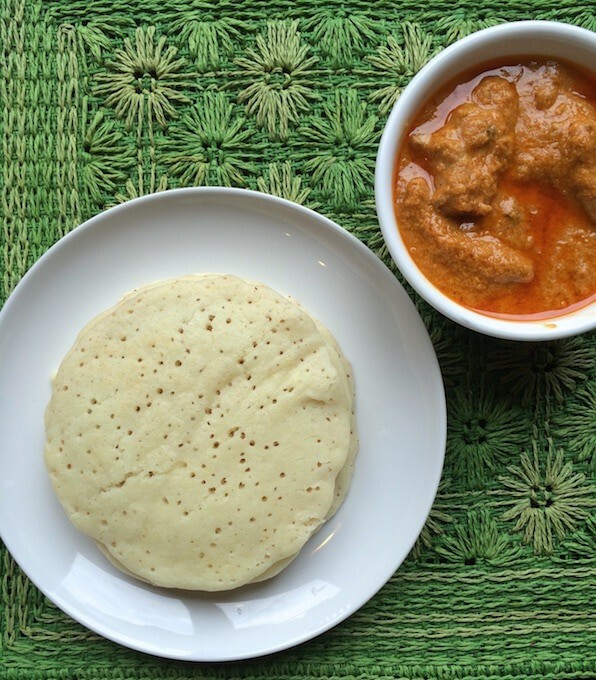 Use of Baking soda – I had to add baking soda for the dosas to turn soft and spongy, you don’t have to if you live in India. Make a dosa without the baking soda, if it doesn’t turn soft and spongy like a pancake, then add 1/2 a teaspoon of baking soda to the batter. Batter consistency – Remember the consistency of the batter should be thicker than the one you make for dosas more like pancake batter. Use a heavy bottomed pan – Use a thin pan and your dosas will burn very quickly. Do not overheat the pan – I have noticed the dosas brown nicely when the heat is set to medium to low heat. The key is to cook on low heat. Flipping the dosas – The cue to turning or flipping the dosas on the other side is when the edges start looking dry AND when the bubbles that have formed on the dosa start popping. You don’t have to flip them – cooking on one side is fine as well. Click on the stars to rate! Whisk the yogurt with water to make buttermilk. Wash and rinse the rice and soak the rice and methi seeds in buttermilk until the rice is completely immersed. Add more water if needed to completely soak the rice. Let it soak for 3-4 hours. Heat a heavy bottomed pan for 2-3 minutes on medium to low heat. Grease it with clarified butter. Using a ladle to scoop the batter and pour it into the pan. Cover the pan and let the dosas cook for 3-4 minutes. Uncover the pan. At this point, bubbles would have started to form and pop. Flip the dosas on the other side and cook for a minute or two. 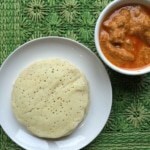 (Note: if you notice that the dosa is not soft and spongy, add 1/2 teaspoon of baking soda to the batter and mix well). Serve immediately with chutney or kori rassa. Disclaimer: Approximate Nutritional information is provided as a courtesy and can vary depending on the exact ingredients/brands used. If you have health issues, please work with a registered dietician or nutritionist. Tried this recipe?Take a photo and tag @simmertoslimmer or use the hashtag #simmertoslimmer on Instagram for a shoutout! Hi! I am Anu - I combine my passion for food and photography to create easy, delicious and visually appealing Indian inspired recipes to inspire busy moms to cook more often at home. I love your website and all the details you add to recipes. Question: do you use a proper grinder/mixer to grind your rice? I’ve seen different opinions about how smooth this batter should be. I have a good US style blender. Will this work for this recipe? Simmer to Slimmer is a participant in the Amazon Services LLC Associates Program, an affiliate advertising program designed to provide a means for sites to earn advertising fees by advertising and links to Amazon.com. Disclosure: Simmer to Slimmer is a participant in the Amazon Services LLC Associates Program.